"One of the most outstanding prophets of our time." "The greatest theologian we have in the United States, by far." "The greatest theologian in the Catholic Church today." 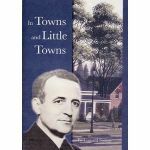 Leonard Feeney was born in Lynn, Massachusetts on February 15, 1897. On the eve of Our Lady's Nativity, September 7, 1914, he entered the Jesuit Novitiate of Saint Andrew in upstate New York. 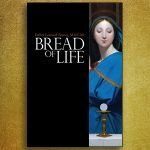 During his 14 year formation as a Jesuit, he studied in England, Wales, Belgium, France, and the U.S.A. At the end of a brilliant scholasticate and theologate, he took religious vows as a son of Saint Ignatius, and was ordained a priest on June 20, 1928. 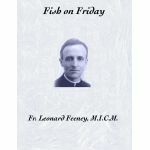 Father Feeney then embarked on what would become one of the most celebrated careers any priest could enjoy as a writer, lecturer and editor. 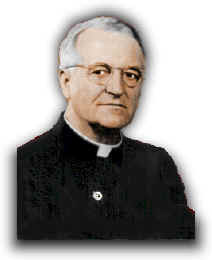 During the 1930's he was literary editor of America, the Jesuit-run Catholic monthly. 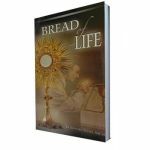 At the same time, his books, published by some of the major publishers of that time, were becoming standards in Catholic schools and homes all across the country. They include Riddle and Reverie (MacMillan, 1936), Song for a Listener (MacMillan, 1936), You'd Better Come Quietly (Sheed and Ward, 1939), The Leonard Feeney Omnibus (Sheed and Ward, 1943), Your Second Childhood (Bruce Publishing Company, 1945) Mother Seton, an American Woman (Dodd, Mead & Company, 1948), Survival Till Seventeen (Sheed and Ward, 1948). Father's genius as a writer, speaker and theologian, was attested to by some of the most prominent Catholic figures of his day. Bishop Fulton Sheen once said that the only substitute he would allow on his radio show was Father Feeney. 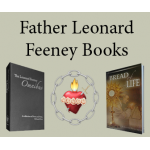 Frank Sheed, of Sheed and Ward said, "For Father Feeney, dogma is not only true; it is breathlessly exciting. That is his special vocation. . . to make his readers feel the thrill." 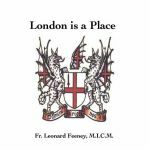 During Father's days at Oxford, Lord Cecil, the famous Oxford don admitted, "I am getting more out of my association with Leonard Feeney than he could possibly get from me." Of the Jesuit's writing, Cecil said, "it shines with a pure, clear light." 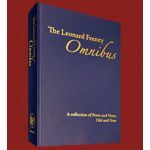 In 1942, during the height of his literary fame, Father Feeney was transferred by his Jesuit superiors to Saint Benedict Center, a Catholic student center which had been founded two years earlier by Catherine Goddard Clarke. Mrs. Clarke had sought the permission of the then-Archbishop of Boston, William Cardinal O'Connell, to establish an educational oasis of Catholic truth close to the renowned secular universities in that area. The Cardinal readily agreed to the project, admonishing Mrs. Clarke to "teach the Faith without compromise." 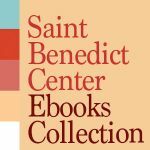 So it was that Saint Benedict Center quietly came into existence that year at the intersection of Bow and Arrow Streets in Harvard Square, Cambridge, Massachusetts. The Center's initial purpose was to provide religious instruction for the Catholic students of the universities and, in keeping with the instructions of Cardinal O'Connell, its policy was to teach the authentic doctrines of the Church through the study of Holy Scripture, and the writings of the Fathers, Doctors, and Saints of the Church. This program of studies achieved immediate success, filling the spiritual vacuum created by an obvious deficiency in the neighboring academic institutions. The Center was attended in large and growing numbers. With Father Feeney's transfer to Saint Benedict Center, a whole new era in his life — and in the lives of countless others — was to commence. Within three years, he came to see clearly that the Church was headed down a dangerous path of compromise and accommodation, leading to what is now universally recognized as a "crisis in the Church." Not only did Father see the problem before anybody else, he also saw the primary cause: the obscuring of the Catholic Church's teaching "outside the Church, there is no salvation" (extra ecclesiam nulla salus). After Father Feeney’s death in 1978, the great Scottish apostle of Christ the King, Hamish Fraser, eulogized him as "one of the most outstanding prophets of our time. For not only did he most accurately diagnose the contemporary malaise, long before others became aware of it; he also put his finger on the very omission which was both symptom and cause of the plague of liberal indifferentism which eventually surfaced as post-Conciliar Neomodernism and oecumania."